As a registered provider of the NDIS we pride ourselves in providing you with the best evidence-based, multi-disciplinary, hands-on therapy supports in the most affordable way possible to achieve your individualised goals. The National Disability Insurance Scheme is a national scheme that allows you to have the choice and flexibility in services and supports to best help you, your child, or your family member to achieve your goals. Who can I ask about the NDIS? Am I able to access the NDIS? An individual with a disability that makes it difficult to participate in daily activities and that is likely permanent is eligible for NDIS funding. To see if you, your child or family member is eligible please see the requirements at https://www.ndis.gov.au/people-disability/access-requirements.html. 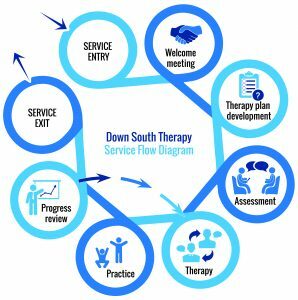 If you have questions regarding your eligibility and would like further information regarding the therapy supports and services that Down South Therapy provides please contact our NDIS team at Down South Therapy on 0404 698 218. How can Down South Therapy assist me in navigating the NDIS? We recognise that navigating the NDIS system can sometimes be complex and overwhelming. This is why we have Down South Therapy NDIS Planners that can help you with this process as well as co-ordinate your therapy supports. Best of all, our planners are therapists, so they know and understand the NDIS system as well as how to best support client therapy needs. During your NDIS planning process, we can assist you by liaising with your Local Co-ordinator to make sure nothing is left out of your NDIS plan. Once your NDIS Careplan is in place we allocate a Planner to come and speak to you in person or over the phone to help identify your therapy goals. Once we have set the goals the Planner will write an Individualised Service Plan (ISP) that is a mutual agreement of everything you would like to achieve for the duration of that plan. Once the ISP has been signed we allocate therapists to start working with you to achieve your goals. Once your ISP is in place and your therapy starts your planner likes to keep in contact with you regularly throughout the year. We review all our client's ISP's quarterly to make sure everything is on track for you to achieve your goals. At any stage you are able to contact your planner or your therapists and add to or change the goals on your ISP. How can Down South Therapy assist me with the NDIS? At Down South Therapy we ensure that you, your child, and your family are provided with the best evidence-based, individualised services to help you achieve the goals that are meaningful for you. We provide an innovative, functional, fun, high quality, specialised family-centred service that is flexible and empowering to our families. You also have peace of mind in knowing that we are a registered provider under the NDIS through meeting all standards of care across the 6 National Standards for Disability Services. Helping you or your family member to develop the skills that will enable them to participate in activities of everyday life such as school and community performance and participation, getting dressed, toileting, mealtimes, regulating emotions and behaviours, improving attention, playing and socialising with others, and becoming more independent in valued and meaningful activities. Using evidence-based Speech Pathology approached to therapy to help overcome speech-language difficulties and improve their ability to communicate. Common concerns are articulation, comprehension, literacy difficulties, stuttering, and limited to no use of words or verbal communication. Enhancing strength, endurance, co-ordination, quality of movement, confidence, and participation in activities. This includes motor skill development (such as walking, running, standing etc), posture and balance, and flexibility. Our physiotherapists are also highly skilled in upper and lower limb rehabilitation and hydrotherapy. Developing life and social skills that give more independence, help participation in school and in the community, give the confidence to learn, and help to grow meaningful relationships. Supporting individuals with a diagnosis to overcome barriers that may be impacting on their participation in everyday activities. We also support families, caregivers, teachers, and support workers through advocacy, education, and sharing of strategies and resources to best assist in their continued growth and development to achieve your goals. Supporting individuals both with and without a disability to participate in the community in their valued and meaningful activities, whether it’s for work, education, or leisure. Researching, developing, sourcing, and providing equipment to individuals that will assist them to participate in daily activities at home and in the community. Preparing children for school, helping in the development of their skills for learning and socialising, boosting confidence and helping them to get excited about learning. Giving children who are entering or are already in school a boost to help them learn to socialise and make new friends. Fully mobile service - we come to you and are experienced mobile practitioners, if this is not suitable we also have rooms that we can utilise in the community. Comprehensive standardised functional assessments and reports. Individualised planning and goal setting for you/ your family member based on your/ their strengths, interests and needs that can change as your needs change. Individualised and family-centred therapy that is tailored to you/your family member and your/their unique goals based on evidence-based practice. Session preparation including all equipment and resources taken to you for the session. Feedback after every session to yourself and/or key stakeholders (e.g. teachers, carers etc) via a means of your choosing. Weekly discussions and planning between your team of therapists and you/your child. Co-ordination on session times on a weekly basis with yourself or with another key stakeholder. Writing formal individualised home and school programs. Writing assessment reports for your family, teachers, care workers or other health professionals. Access to 1:1, paired, or group therapy sessions based on your needs and goals. Meetings and phone calls with teachers, parents, and other stakeholders. Providing advocacy support for you and your family. Writing equipment and funding applications including researching and gathering quotes. Developing/programming Augmented and Alternative Communication devices such as PODD books and communication boards. Developing resources that are produced for the family to keep such Social Stories and activity programs. Development and reviews of your Individual Services Plan and Intervention Summaries. Parent, carer, and teacher training and information sessions. Can assist you and your family member with their therapy needs across the lifespan, meaning that you will be able to continue to access our services at any age. Have a team of male and female health professionals who are experienced in working with individuals with a range of diagnosed and undiagnosed conditions such as Autism, Down Syndrome, Cerebral Palsy, hearing and vision impairment, acquired brain injury, developmental delay, intellectual impairment, attention and sensory regulation, motor skill development, dyslexia, dyspraxia and specific skill based difficulties impacting on performance and participation in activities at home and or in the community. Will always put you and your family first – we only work on goals that are meaningful to you that are developed in collaboration with you. We are flexible in changing goals and prioritising goals based on your changing needs. Provide a trans-disciplinary therapy approach which is proven to be the most effective method of intervention. A trans-disciplinary approach requires the team members to share roles and systematically cross discipline boundaries. The primary purpose of this approach is to pool and integrate the expertise of team members so that more efficient and comprehensive assessment and intervention services may be provided. Have been recognised through business awards and National Awards by Occupational Therapy Australia for Innovation in Practice recognising excellence in evidence-based practice. This is the result of our team’s extensive experience using quality, evidence-based and innovative therapy approaches that bring great results for our clients. Experienced dedicated NDIS team who can assist you in navigating and making the most of your NDIS plan at all stages. We have been involved in the NDIS since the trial of the WA NDIS My Way Scheme and have been actively involved in local advisory groups. Flexibility in times and locations of appointments. We can manage your NDIS funds meaning you will not have to worry about paying invoices and the additional government paperwork. We complete all legal administration requirements, this includes progress notes, referrals and Intervention Summaries. Flexibility to have a choice of therapist/s or therapy assistants based on your goals. Monthly newsletter updates from Down South Therapy containing information on useful strategies and events occurring in the community. Invite our families to events that we hold in the community, such as our yearly Christmas party.